News to prick up the ears of brokers as King Juan Carlos of Spain renounces the use of his royal yacht, the 41.5m ultrafast motor yacht Fortuna. 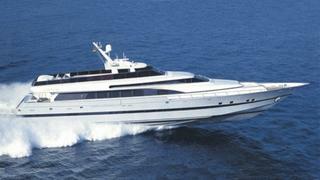 Delivered by Izar in 2000, Fortuna was crowned the world's fastest superyacht, reaching 68 knots. Her extraordinary turn of speed is delivered by three Rolls Royce gas turbines linked to triple waterjets plus two MAN engines. The recent news may be connected to the fact that polls show public confidence in the Spanish royal family slumping as people smart from severe cuts to welfare, a double-dip recession and an unemployment rate of more than 27 per cent. So who will be the broker appointed to sell Fortuna? Watch this space.